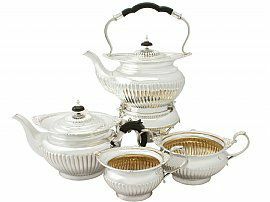 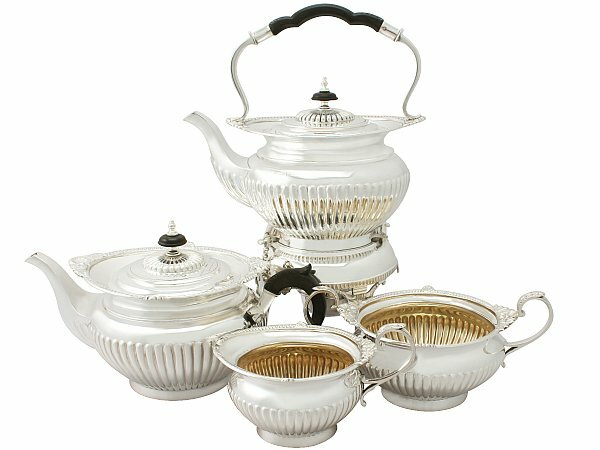 This fine antique Edwardian sterling silver four piece tea service / set consists of a spirit kettle, teapot, cream jug and sugar bowl. 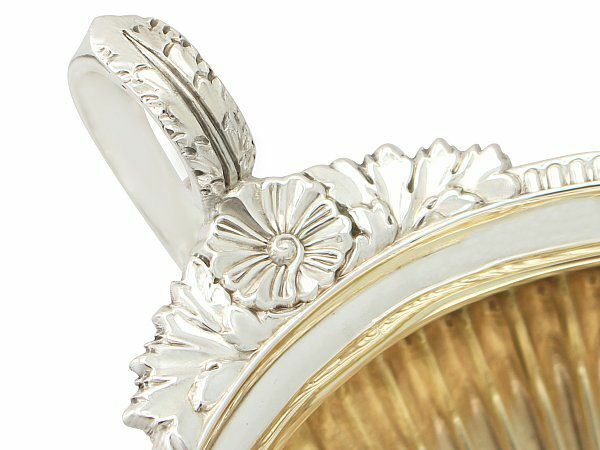 The pieces of this service have a circular rounded form onto a collet foot, modelled in the Queen Anne style. 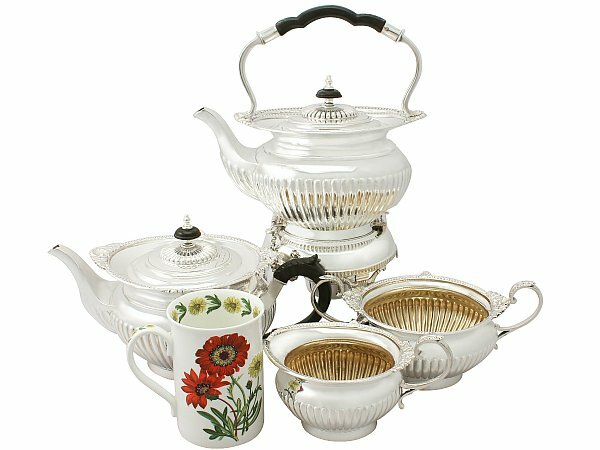 The rim of each piece is ornamented with an applied simplified egg decorated border accented with two scrolling leaf motifs and two floral and leaf designs. The lower portion of the body of each piece is embellished with fluted decoration. 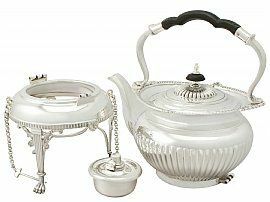 The spirit kettle and teapot retain the original hinged hallmarked covers, which feature fluted decoration over the domed portion. The teapot has a flush hinge, indicating the fine quality of such a teapot. Each cover retains the original painted wood and sterling silver topped bun style finial. 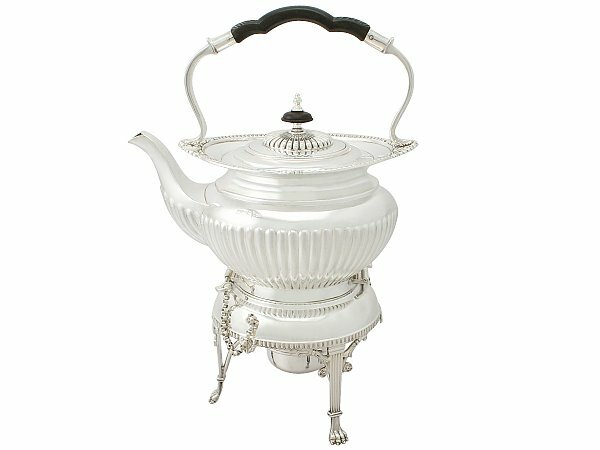 The teapot is fitted with a carved painted wood C scroll handle with acanthus leaf decorated thumbpiece. 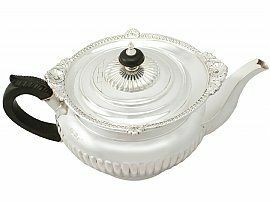 The spirit kettle has a carved painted wood shaped handle with acanthus lead decoration. 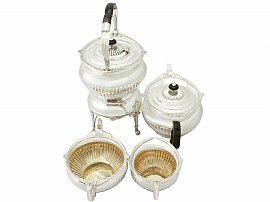 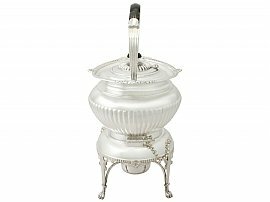 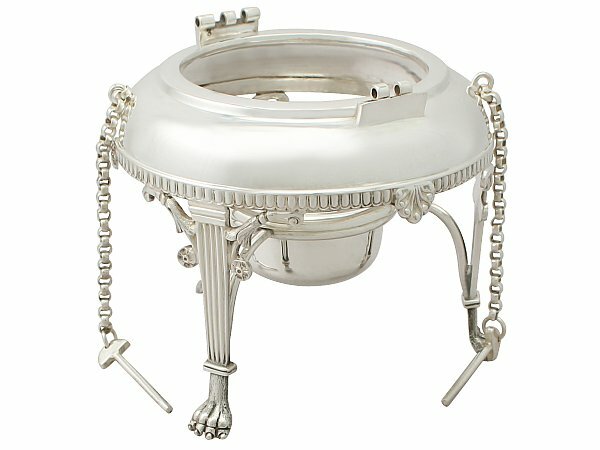 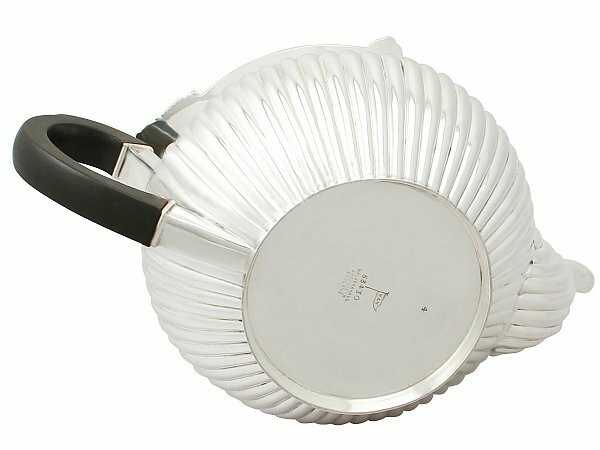 The fine and impressive kettle is supported on the original hallmarked detachable three-legged stand fitted with two locking pins and associated security chains. 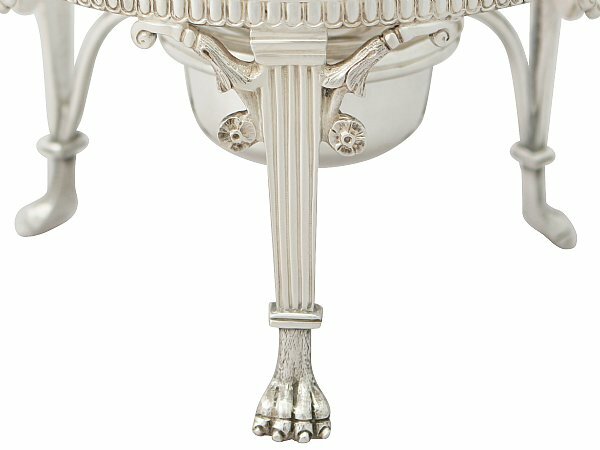 The stand is ornamented with an applied egg decorated border with scrolling leaf and flower motif leg brackets to three slightly tapering, column style legs and Regency style paw feet. The detachable hallmarked spirit burner is ornamented with a rope twist border encircling the neck. The spirit kettle and teapot have swan necked spouts ornamented to the underside with fluted decoration. The cream jug and sugar bowl are fitted with sterling silver C scroll handles with bifurcating scrolling terminals and acanthus leaf decorated thumbpieces. 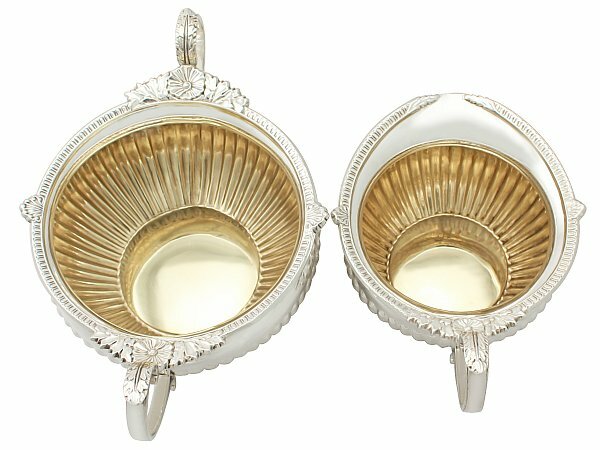 Both the cream jug and sugar bowl have a gilt interior. All the pieces of this tea set are a very good gauge of silver, fine quality and in excellent presentation condition. 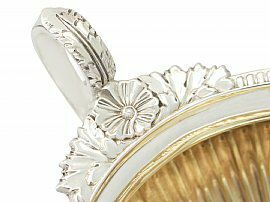 The applied decoration to each piece is very sharp. 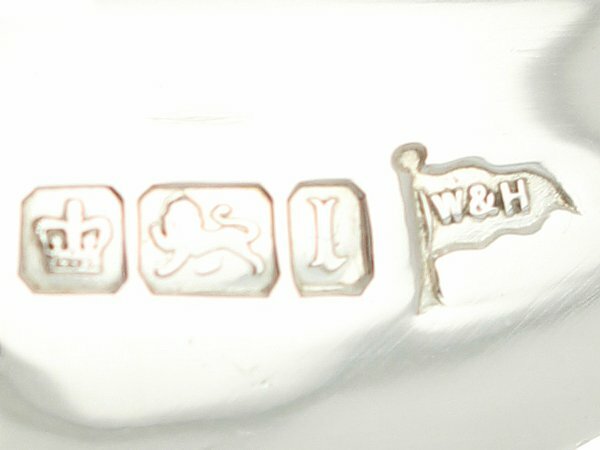 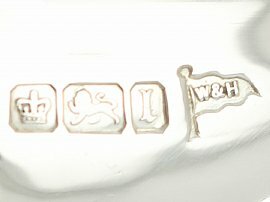 Full hallmarks struck to the surface of the each piece and part hallmarks to the covers are all very clear. 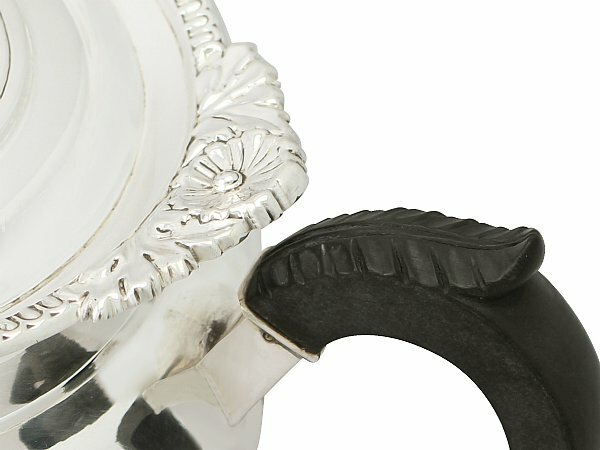 Length from back of handle to tip of spout 21.5cm/8.4"
Length from back of handle to tip of spout 25cm/9.9"
Height to top of finial 13.7cm/5.3"
Height to top of handle 8.8cm/3.3"
Height to top of handle 9.2cm/3.6"